I have made many scrappy quilts! They are my favorite to do! No matching or thinking is involved! My favorite is the Trip Around the World that I did last year. This book looks so awesome! Thank you for the chance to win it. I love making scrappy quilts and my favorite one is a scrappy sampler quilt made with many different blocks and an Irish Chain setting. I think my favorite scrappy quilt right now is my rainbow Farmer's Wife quilt! I want to make a blue scrap quilt for my blue guest room! 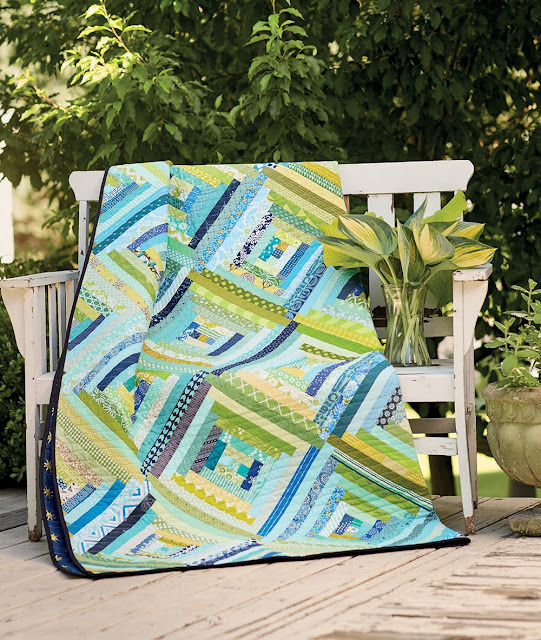 Love the cover quilt, but the greens and blue are tempting. It's my tumbler block quilt, so scrappily batik! What a beautiful book. I've made a scrappy trip around the world and an Irish chain quilt. I've made a few scrapbook quilts. I love my rainbow cat quilt. I haven't made a scrappy quilt yet, but would love to make an Irish chain or something similar. 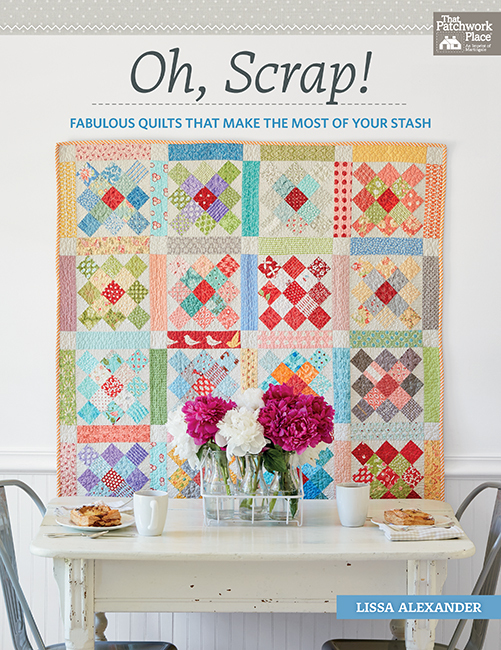 This looks like a fabulous book for the scrappy quilt lover! I'm planning on making a bright and cherry scrappy pineapple quilt but I have to get a few projects finished up before I start it. My favorite quilts to make are scrappy quilts! Thanks for this chance for some more ideas! I made a scrap string quilt that i LOVE. I'm thinking about making a rainbow one next. I made a hexagon English paper pieced quilt with all scraps from my first 3 years of sewing. It is full of memories! I just finished a scrappy Split 9-Patch....and I love it! Thanks for the review of this book and offering it as a giveaway. That's so generous of you! My favorite scrappy quilt that I made is called Scrappy Leftovers and, well, it's really scrappy. I created the pattern. You can see it at http://joyforgrace.blogspot.com/2017/06/a-lovely-finish.html. My favorite scrap quilt was a snowball quilt that I made with binding leftovers from the comfort quilts our guild makes. Each snowball was like a 3 rail fence block, blunted at the corners. It was a bright, festive quilt and I hope it made some little person very happy. I made a small Jo Morton basket quilt for my dining room wall, in controlled scraps of reds, blacks, and lights to tan/gold reproduction fabric. I always smile when I see it on the wall. I recently finished my Moda Blockheads quilt that was a year-long adventure using ONLY my scraps. So fun! Like to make the Surrounded Quilt! So Neat! Thanks for sharing! Surround quilt would be a fun one to make. I would love to do a scrappy log cabin quilt! My three favorite quilts are all scrappy. One has a center section of about 100 different 2-inch squares. I love scrappy quilts. 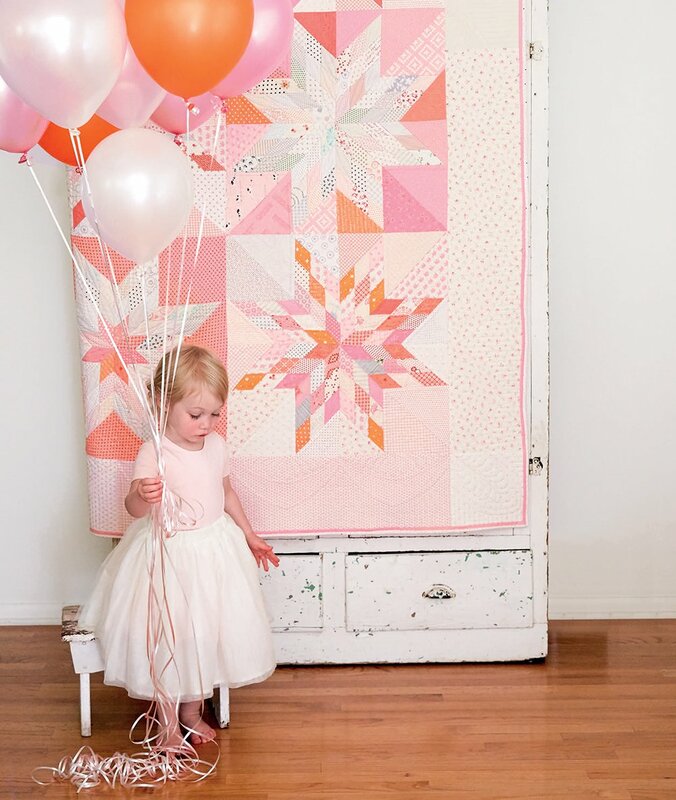 My favorites are Grandma Mary's 5 patch, album/ trip round the world designs and pineapple stars from Bonnie Hunter. I would love the Lone Srar pattern in this book. I never have enough low volume neutrals so send your overflowing bins to me! Thanks for sharing! I made a bed runner with the blue scraps from a big quilt...it was improv and totally fun!!! I want to make a scrappy log cabin quilt. It has been on my to-do list for awhile. I made a scrap pinwheel quilt for my sister & brother-in-law for their 30th wedding anniversary, which was the same year they both turned 50. It was set in a Boston Commons arrangement, that gave room for some hand quilting feather motifs. I haven't made a scrappy quilt yet. I am thinking of the Farmer's Wife with cream as the background. The scrappy log cabin looks like great fun. Thanks for sharing the wonderful patterns from this new book. My favorite is always my current project. Right now that is Flutterby by Jen Kingwell. My favorite scrap quilt is your Stamp Collection Quilt which I've already started. However, this Oh! Scraps! book will help me diminish my scrap piles a ton! I am almost finished putting together my checkerboard rails quilt and I am so happy with all the colors I used.That looks like a really good book to have. I've been wanting to make a Surrounded quilt for awhile now. Thanks for the opportunity. My favorite scrappy quilt is one I made with 2,240 1-1/2" squares - completely random, pick from a pile leader and ender. I have two favorite scrappy quilts...the first one was a blue and white log cabin that I made for my father in 1998. It was about 90X90 and I love it. The second one is a scrappy nine patch set on point made from 3 inch nine patches that were part of a guild swap. It is a queen sized quilt that I use on my bed everyday. most of mine are scrap quilt's in the effort to get ride of some , they multiply like rabbits. Oh this book looks wonderful!! Thanks for the opportunity to win it! My latest and current favorite scrap quilt is one I made from Amy Ellis' Modern Heritage Quilts book - she did a free sampler on facebook using blocks from the book. All of it came from my scrap baskets- that's why I love scrap quilts- it's like they are for free! Love your blog! I like to make nine patch and postage stamp scrappy quilts. Oh Scrap looks like a fun book. I love using scrappy HSTs, they are so many ways to use them! I'm working on a scrappy log cabin quilt for my bed. The colours are blues, greens and purples. this book looks phenomenal. I love scrappy quilts, I've had a hard time choosing my favorite, but I have a 16 patch star quilt that used up lots of scraps and that was fun. I like doing Scrappy quilts with the rectangle & flying geese dies from my Accuquilt. My favorite and only scrap quilt I have made is the Tumelo Trail pattern in Bonnie Hunter's Scraps and Shirtails Two book. Lissa's book looks to be a lot of fun too and I love the quilt you made. I have been wanting to make a scrappy Burgoyne Surrounded quilt for awhile, but your Kismet quilt really appeals to me too! I also am drawn to Lissa's Surrounded quilt. The picture of the Lone Star sherbet is amazing too!! I have wanted to make the Surround quilt since it was in American Patchwork and Quilting, even pulled fabrics but was overwhelmed by all the cutting. One block at a time sounds like a lovely way to make it. I love scrap quilts for there reasons you listed, sometimes I'll even make another "planned" quilt just so I can get the scraps from it for a scrap project I have in progress! My favorite scrappy quilt is Long Time Gone that I made in Jo Morton fabrics. I LOVE that scrappy look! My last scrappy quilt was a log cabin. This book looks fabulous. I’ve always wanted to try a scrappy string quilt. My favorite scrappy quilt is a Christmas log cabin I made last year. 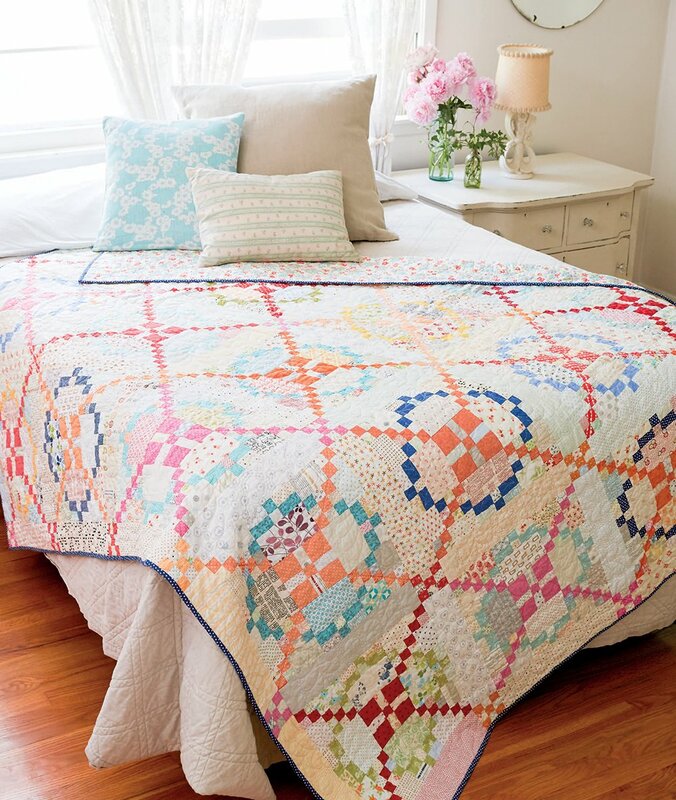 Love the Kismet quilt. I have plenty of blue and green scraps and would be thrilled to make one for myself. Almost all of my quilts are scrappy and I love making them. I love them all! I just finished a 'Scrappy Chains', and I love it! Thank you for the chance to win "Oh, Scrap!". I have not made a scrap quilt yet. Would love to win the book and make the lonestar. I love scrappy, and my most recent is a pickle dish. I LOVE your blue and green quilt! My favorite scrappy quilt is one of Lori Holt's quilt alongs from a few years back. I used all scraps and I call it my "free" quilt! I love that I can make scrap quilts from leftovers and not spend anymore money. It makes me feel so frugal!! I believe my favorite scrappy quilt is the one I'm working on now, on the side so to speak. It is a leader and ender mostly civil war scrappy quilt. It will have a beige neutral small size Irish chain running through it and I love it ~ my pieces are actually getting bigger. It will get finished someday as I make my other projects along with it! My favorite scrappy quilt is my QAYG log cabin. I used only fabrics from other quilts I had made, favorite fabrics, so every block is so sentimental for me, and reminds me of the people I love, for whom I've quilted. I'm finishing it up now, and I love every moment I spend on it. I can't wait to snuggle under it, and see our nieces and nephews find their own fabrics in it. Now I"m making sure to save the fabrics from ongoing quilts so I can make another one of these, maybe in a different pattern (square in a square?) that I will love just as much. Last year, I made my first scrap quilt - a Paddlewheel quilt, using Lynette Jensen's pattern. It was nice to use so many fabrics with connections from other projects. Your blue and green quilt is beautiful! My favorite scrap quilt is Scrappy Trip Around the World ala Bonnie Hunter! It just makes me happy to cuddle under it or just see it across foot of the bed. So looking forward to Lissa’s View of scraps. I've got the scraps, now to decide on a pattern. Leaning toward a scrappy nine-patch. I love scrap quilts and I have made several. My favorite is the log cabin. Lissa’s book looks like a great one! I want to make a churn dash scrap quilt ... it’s one of my favorite pieced blocks. I also want to make a leaf appliqué scrap quilt, using local leaves that I photograph on walks and enlarge. My favorite scrap quilt that I have made is a Smith Mointain Morning by Bonnie Hunter. I made a tumbler quilt with scraps. It turned out great. I have a Burgoyne Surrounded quilt in reds and white/beiges in progress, which is scrappy. My favorite so far is "Square & Scrappy" from Edyta's book. I used lots of fabric from Jelly Rolls. I've made one scrappy quilt and would definitely make more. I didn't think about colour at all, just used whatever came next. It turned out really well. it would have to be stairsteps...i already have a stack of 4-patches to use for this...great giveaway...lovely quilts, all of them! Love making scraps quilts....My last one was 9 patch of all the colours under the sun ! I want to make a wonky star quilt. It will be a good scrap buster as well as fun to make those star points go wherever. Most of my scrappy quilts are a "controlled" scrappy. The latest one I worked on was using blues and browns and is based on the Harmony pattern. The light blues and browns create ribbons across the quilt. I'm new at quilting so I've never made a scrappy quilt, but I would love to try Lissa's "Surrounded" quilt. Currently working on a Scrappy pineapple quilts with my quilting buddy, we are sharing scraps and truly enjoying the process.love this book! I’ve made two scrappy courthouse steps quilts which I love, and will make more. They’re my all time favorites! My favorite scrap quilt to make is the Scrappy Trip Around the World. I loved all my grandmothers scrappy quilts. There are so many I want to make. I have always loved the double wedding ring. I have saved all my scraps over the years from sewing for my kids. I just inherited some of my grandmothers scraps and a few scrap blocks. What a fabulous new book! Thank you for a chance to win a copy. I would love to make Bonnie Hunter's Pineapple Blossom scrap quilt. It's on my "to do" list. 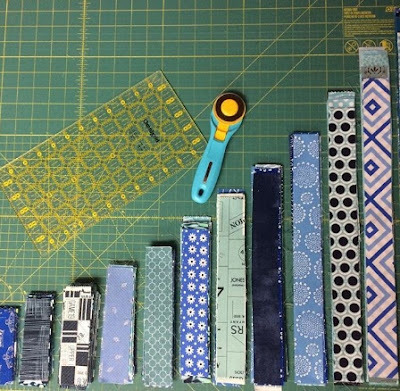 I have never made a scrappy quilt before, but I am currently working on a scrappy churn dash quilt using a tutorial from Amanda Jean (Crazy Mom Quilts). The fabrics in the churn dash are my leaders and enders pieces. Who knows when I will finish it but so far I am enjoying the process. My favorite is called Indian Hatchet. I am starting a second one, as headers and enders. My favorite scrappy quilt is my 1000 pyramid charm quilt... 1046 different scraps of fabric to be exact. And, I made three of them in different sizes. I love them! I would like to make a scrappy trip around the world. A Courtyard quilt was my biggest scrap challenge, since you need to plan in advance what prints will carry on into the adjoining blocks on all 4 sides. A design wall is a must! I have not made a scrappy quilt, but I need to so I can cut down on the fabrics that are taking over my house. I'm sure there will be some easy ones in my future. My most fun Scrappy quiilt has to be the Bowtie Quilt I did as a Leader and Ender with Bonnie Hunter in 2011. My Hubby Loves sleeping under it's scrappiness. The PLUS is it doesn't show the dirt. Lovec your Kismet quilt. That one might have to be one I make from Lissa's great Book! Cutting as I go works best for me. Less chance for a Miscut along the way. Oh I love the look of this book - as a self-described scrappy quilter, this book is a must for me! My favorite, which also is my favorite fabric and movie, is Casablanca in batik. What a great looking book!! As are yours!! My favorite scrap quilt so far was a multi-colored and neutral log cabin in an around the world setting. My favorite scrap busting quilt was an Irish chain that was full of 2” squares. Love scrappy quilts! I make the Nonnie Hunter Mystery Quilt each year. I have 2 favorites, one is Celtic solstice. I'm working on my first scrappy, all 2 1/2 inch squares. Love the ideas in this book! Thank you! Looks like an awesome book! I make lots of scrappy quilts, but the latest was On Ringo Lake designed by Bonnie Hunter. I am currently working on my first real scrap quilt. It's a leaders & enders project, so it's going pretty slow. I’ve been wanting to make the Surround quilt ever since I first saw it. I made a scrap quilt called "confetti", and love it still to this day. Very fun and colorful!! and I enjoyed every bit of it, especially how it turned out! It was called Life-a-Plenty by Woolen Willow Designs. Would love to win a copy of Oh Scrap! Looks fabulous! My favorite scrap quilt is a Scrappy Bargello (pattern by Bonnie Hunter). My husband needed a quilt for his bed at hunting camp so I grabbed bunches of leftover 2.5” strips and told him it might be ugly but it would keep him warm. Funny thing is it wasn’t ugly and we enjoyed seeing the varied fabrics used. I lost my husband unexpectedly three years ago so this now makes his quilt extra special to me. My favourite scrappy project is a little hexagon table topper that I have just finished. Love to use up all my pretty scraps! Thank you for the chance to win this lovely book. I have LOTS of fabric so most of my quilts are scrappy! I love the look of scrap quilts, all kindsand every kind. My dream quilt to make is a crazy quilt. Trip Around the World or a postage stamp scrap quilt. I have also been collecting my leaders and enders for a scrappy quilt. My favorite scrap quilt is a string spider web quilt that lives in my family room. I would love to make a scrappy Irish chain quilt. I have started a scrappy string quilt that I am loving, using up a ton of colors I kept skipping over in other quilts, like bright oranges. I'm finishing up the Splendid Sampler quilt which is done in scraps, in my case, 30's scraps. I'm loving it! My favorite scrappy quilt is still the Courthouse Step/Log Cabin quilts I make. This book by Lissa sounds wonderful though - love seeing all the different patterns within! My favorite was a quilt with oodles of 2 1/2” squares. My friend organized a swap so we each had plenty of unique ones. To this day it is still in my top five. I made a quilt with leftover Bonnie and Camille fabric, I just love it. This book looks great, i have never mmade a scrappy quilt yet. This book would get me into the mood of makking some scrappy quults. I love scrappy quilts I’m just not good at them yet, but working on it!! I would love to make `Surround` quilt with scraps. I'm working on a scrappy trip around the world quilt. Just need to quilt & bind it! I have so many scraps and it would be a darn shame to waste them. But where do I begin? I need help. The favorite scrappy quilt I have made would have to be the one on my bed. It was a mystery from a local quilt shop. I used a lot of novelty fabrics and my children and I have spent many hours playing “I spy” with it. That is an ageless game that we will never tire of. My favorite is the one I'm working on right now as part of the Sewing a Village group. All my houses in my village have been scrappy, and it has been absolutely a joy to do them. I made a scrappy Irish chain many years ago. I love looking at the fabrics no longer in my stash, fond memories! Oh, goodness!! I would LOVE to make that "Sherbet Stars" quilt! It is so perfect! I'm a sucker for star quilts. I haven't made a scrap quilt yet (although I have made a "bonus" quilt out of scraps) Would love more ideas on how to use all my scraps! I have only made one scrap quilt so far. It was very stressful for me picking out the fabrics, but I really love the finished product in all of its cohesive randomness :) I really want this book so I can clean out some of my scrap bins! i love my Scrappy Log Cabin. I struggle with the fabric choices and would love a little more guidance! I made a Bonnie Hunter scrap quilt called Double Delight. It also has lots of little nine patches. I love the wonky scrappy log cabin quilt I made for my son! tks! I'd love to make a log cabin with lots of low volumes and bright colors! This book looks great! I love a string quilt I made a few years back - I use it often! How can I choose just one! I need a therapist... All kidding aside, my favorite to date is a sampler I made of leftover batiks. One of my favorite scrappy projects is my string quilt in progress, but I love them all. Thanks for sharing. 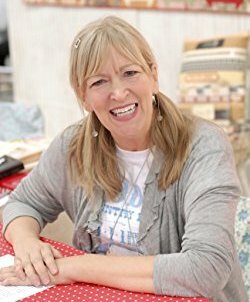 I've made five Scrappy Trip Around the World with Bonnie Hunter's pattern - I think I need to come up with a new favourite way to use scraps! Thank you for the giveaway! WOW! Lou LOu carries the little jelly plastic purse closures! I made a scrappy Drunkards Path with a black background and bright colors. There were floral appliqués on the corners. Still one of my favs. I've never made a scrappy quilt, but Surrounded has been on my list ever since I saw it in American Patchwork and quilting magazine. I love your scrappy version of the courthouse steps, too. I made a string quilt from my scraps and look forward to making another one! I want to make a scrappy trip around the world. I would like to make a scrappy log cabin quilt. What wonderful quilts! My current favorite is my scrap vortex in working on . Surround is my next project. I have admired this quilt design since the APQ Tone It Down quilt-along. Love Lissa’s book. It is on my wish list! Thank you for the chance to win a copy! I actually have a Burgoynne Surounded in the works. Its been a UFO for a while now but started as a swap with friends from my guild. I think there were 8 of us that swapped segments of the block so our finished quilts would look even scrappier. I love every quilt I’ve seen on the tour and MUST have this book!! I am 5 years into quilting and have not yet made a quilt from scraps, but currently have Sunday Morning low volume and Converging Corners on my ‘Someday’ list. Kismet is on the top of the list! One scrappy quilt I want to make??? Way too hard! I have a list! And these look like they should be added to that list-lol! Loving the colors in Kismet! I am currently making a neutral scrap string quilt while at my guild retreat. Everyone attending is going nuts over it. I love scrap quilts. I have made baby quilts from scraps. I really want to make the Surrounded quilt - beautiful!!! These quilts are great. I've got a postage stamp scrap quilt on my make list right now! I am working on a log cabin scrappy quilt. I made a scrappy Arkansas Crossroads quilt that I love. I'm more of a controlled scrappy person, but this one is gorgeous. I have been wanting to try my hand at a string quilt, so I'm excited to see how wonderful yours turned out! I'm working on Bonnie Hunter's On Ringo Lake. I'm putting the rows together, so it's starting to take shape! I enjoy string quilts but the photos of the Firecracker quilt appeal to me. So many choices! I love scrappy quilts and am in the process of making a Granny Square quilt top right now. I love string quilts too and anything scrappy! My favorite scrap quilt is the first one I ever made. I started hand piecing four patch blocks when I was a child. I finished it years later, now I use it daily! scraps stored in individual containers are the first place I go to start to play. sitting on my shelf would be in use.. I just finished a scrappy double 4 patch with all of my Fig Tree scraps. It's a pattern by Laundry Basket quilts called Scrappy Chevron. This was also my first leader-ender project and it was so much fun!! Working on Bonnie Hunter’s Many Scrappy Trips...love that pattern! My favorite scrap quilt will be the one I make from Lissa's book! I've used scraps in quilts I've made, but have never made a totally scrappy quilt. I love that I'm still using scraps from a quilt I made my grandson 15 years ago! Scrappy quilts are awesome, I don't have one particular favorite that I have done, which are many. But I do prefer working with the bright fabrics, instead of my older darker colors. Although I do have a neutral string quilt that I adore. I made a trip around the world with scraps; it turned out great. I am a new quilter and I have just a little pile of scraps. Guess I need to buy some more fabric! I made scrappy string quilts for my 8 year old nieces. One was gray and pink while the other was teal and black. One backing was a cheetah print and the other was zebra. They loved them! Scrappy quilts are the best! Most of the quilts I make are scrappy! I love how the different patterns and colors work together. I usually do not have a specific block, just put pieces together in a pleasing pattern. Love, love, love scrappy quilts. My first was a log cabin, but really want to make a scrappy pineapple quilt. I have made Bonnie K. Hunter's Blue Ridge Beauty using blue and neutral scraps. I would love to make the Surrounded quilt. My favorite scrap quilt that I have made so far is Carolina Christmas from Bonnie Hunter. All my scrap quilts are favorites --- like all my children :-) If "pushed, Country Lanes, a pattern from Kaye England, would be at the top of the list (right now). I've made a patriotic quilt out of my red, white and blue scraps. Thanks for the opportunity to win this book. I hear you on the low volume pre-cuts. I'm currently working on the Harry Potter Quilt of Doom - it's so interesting to see how my scraps play together when I'm going for slightly spooky! I have never made a scrappy quilt, but I would love to use up some of my scraps. I love the quilt on the cover of this new book. Scrappy log cabins are some of my favorites with the top one on my list a curvy log cabin that my husband requested. It's in our college colors and lives on the back of our couch. Just yesterday I made a super scrappy little lonestar block and turned it into a baby toy. I love working with scraps!